The concert Hall has 6 Entrances at the ground floor which is on either side of the building. There are 2 entrances to the Balcony on the first floor , one each from either side of the building. In total eight doors for entry and exit into the seating arena. The Seats are divided into Odd and Even numbers with three doors leading to each of the respective sections. 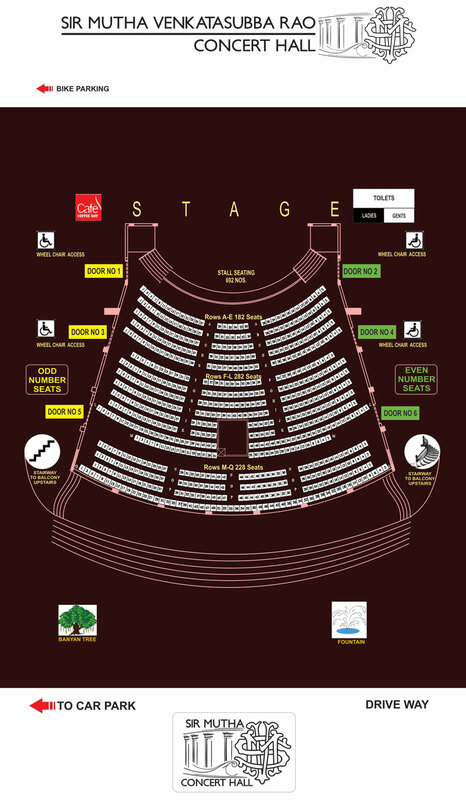 Kindly refer the seating plan to choose the entrance door for the specific row and seat number. Wheelchair Users :Ramped access for wheelchairs are only available for the ground floor seats with entrance through Door II and Door V. There are a total of 12 spaces for wheelchairs , six on either side of the seating arena with close proximity to the doors II and V respectively. These spaces are on Row E in the seating arena. Senior citizens : If you have trouble walking then the route with least number of steps to enter the concert hall for the ground floor are through the access areas close to the café leading to doors VI and V . On the opposite side the best route with the least number of steps to enter the seating arena are close to the Pond leading to doors I and II. To reach the balcony on the first floor the most convenient way would be to go through the spiral staircase leading to door IX. Toilets : The Concert Hall has toilets for both Men & women on the Ground floor near the Pond, close to Doors I and II. These toilets also have facilities for people using wheelchairs. The toilets for the Balcony on the first floor is situated near door X.